Cessna has introduced the latest variant of its Citation Sovereign line at the NBAA convention in Orlando, and announced that the "Citation X" will live on. 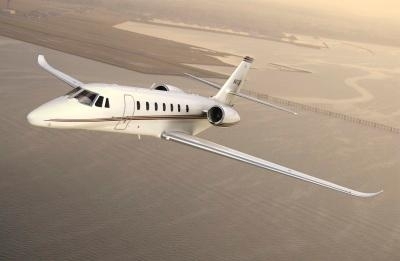 Line flow has already started on the New Citation Sovereign, and entry into service is expected in the early third quarter of 2013. The new Sovereign will also be available with a utility configuration, with options to carry payload, people, or both, depending on the mission requirements. Meanwhile the Citation X name will live on. When the plans were drawn to improve on the Citation X systems and performance, that aircraft was to be called the “Citation TEN”. Through the design and certification process, the Citation TEN has claimed the title of world’s fastest business jet, but customers have told Cessna that they prefer the new aircraft retain the Citation X name. Cessna also reinforced the company’s activities tied to the smart global growth strategy including opening Citation Service Centers in the United Kingdom and Spain. The company announced the first Cessna-owned Citation Service Center in the UK, located at Robin Hood Airport Doncaster Sheffield. The newly-acquired 50,000-square-foot facility, rebranded as the Doncaster Citation Service Centre, offers a wide range of services to Citation customers, from maintenance to modernization and paint. Previously known as Kinch Aviation Services, the business has operated for 15 years and been a Cessna authorized service facility for the past four years. Cessna highlighted the grand opening of its new regional Citation Service Center in Valencia, Spain. The 100,400-square foot (9,328-square meter), state-of-the-art facility is located at Valencia Airport (ICAO: LEVC) in eastern Spain, convenient for Citation customers across Western Europe and North Africa. The Center offers a one-stop shop for comprehensive repair, completion, fulfillment, maintenance and customization services. In addition to Cessna’s extensive U.S. based network, Cessna now operates four Citation Service Centers in Europe, with Valencia and Doncaster complementing facilities in Paris, France, and Prague, Czech Republic.